I made an “anti-germ” blend that is safe for children 6 months old and up. I use it in a spray (kept in purse) to use as hand sanitizer. It’s safe for me to use on Vivian and I use it on myself as well, just in case I get some on the baby. I also diffuse it in the air a couple days per week in the house as a preventative to keep colds away. It smells a little like lemon Lysol, except without the headache I get from Lysol. It got me thinking that the makers of Lysol probably had really good intentions, but then somewhere along the way of R&D they had to alter the formula to make it more shelf stable, make it more cost effective, and the result is something that probably won’t kill us, but not really the best option for our bodies. This blend is just made with Cinnamon Leaf, Fir Needle, and Sweet Orange essential oil. 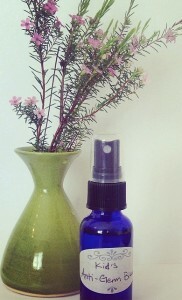 In the spray form, it’s mixed in a good quality witch hazel, which has its own beneficial properties as well. Very effective in slaying bacteria and more gentle on children’s skin than Thieves oil.